A customer wants to pay as little money as possible for their new ride; a car salesman wants to make as much money as possible on the customer’s purchase. To ensure you’re engaging on an even playing field with the dealership, you need to know exactly how they make a profit. Armed with this knowledge, you’ll know where there’s more wiggle room in the negotiation and where there’s not; where there’s flexibility in the deal and where the salesman is going to put more pressure. So let’s break it down. Let the salesman make the first move. Even with online searches and sticker prices listed on cars, those numbers are rarely ever final. They’re basically a starting point, and everyone involved knows that. So a salesman will probably ask something like “What kind of budget do you have?” or “What were you looking to spend on this vehicle?” Once you throw out a number, though, you can’t go any lower than that, even if a lower price may have been on the table. Focus on the total cost, not the payment amount. The salesman might show you a worksheet which lists a monthly payment. By extending the length of the loan 6, 7, even 8 years out, the monthly payment can be shrunk to fit your budget, and the car can seem more affordable than it is. But a long-term loan will simply accumulate more interest over time, and end up costing you big-time money. So just focus on the actual price of the car. If you have a trade-in, don’t mention it until the end. If you’re trading in a vehicle, you’ll want to have done your homework on that too to determine what you can expect to get for it. But you don’t want to mention the fact you’ll be trading in your old vehicle right off the bat. You don’t want the trade-in value to make it look like the new car actually costs less, which the sales guy will inevitably try to do by sneaking that in as a line item on a cost sheet. And a salesman can offer you a sweet deal on the trade-in, which can distract you from the fact he’s offering a not-so-sweet deal on the new car you’re looking to purchase. The same thing goes for other rebates and offers that may be on the table — these should be treated as bonuses, on top of the “normal” deal you would have negotiated on the car anyway; don’t let these bonuses become the discount. Know ALL the numbers, and ask about the “out-the-door” or “off-the-lot” price. When presented with a price, be sure it’s detailed and includes all the fees and extras. You want to be sure you’re seeing what’s called the “out-the-door” or “off-the-lot” price — how much it’s going to cost to drive the vehicle off the lot and into your garage. It’s often a different number from the sticker price. Consider other negotiating fodder. If the price is stuck — the sales guy really can’t come down any more than he already has, and it’s still a bit higher than you wanted — consider negotiating other items that can help offset some of that cost. At this point you can bring up your trade-in, and try to negotiate it higher than what they first offered. You can also negotiate special features (leather seats, towing package, etc.) or a maintenance package — have them throw in a year or two of oil changes (although be realistic about how willing you are to drive to the dealership maintenance shop for this, rather than your neighborhood Jiffy Lube) — or perhaps the spendy 30K, 60K, or 90K servicing. Most things about the transaction are negotiable — you just can’t be afraid to ask. Don’t be afraid to walk away. Always keep in mind that you are in charge of this transaction. You can’t be forced into buying a car, even though it can sort of feel like that after an hour or two of negotiating. If you can’t arrive at a mutually agreeable deal, walk away; the salesman may suddenly decide he can meet your price after all, or he may follow up with you later if they’re having a special sale. If not, it just may not be the vehicle, or the dealership, for you. Knowing how uncomfortable the negotiating process is for many consumers, a lot of dealers and speciality lots now advertise “no-haggle pricing.” In theory, this means the sticker price is the price you pay for the car — no need to sweat it out with a pushy salesman. Is it really no-haggle though? And are prices inflated for this convenience? In general, that advertising claim does indeed bear out. They really won’t negotiate on the sale price of the vehicle. If they did allow wiggle room, word would get out, and they’d no longer be able to claim that they were a no-haggle lot. Is it worth it though? That depends, of course, on the prices! Since you’ve done your homework, you know how much you want to spend, and what a good deal is. If you can find a good deal at a no-haggle lot, and not have to worry about the negotiation process to boot — great! If you can’t find a good deal, head to another lot, and see if they can beat whatever the no-haggle guys are offering. Know, too, that only the car’s sticker price is non-negotiable. Loan rates, maintenance packages, trade-in value, and car upgrades are still negotiable. For some folks, taking the headache out of negotiating will be worth a small price difference. For others, who like the little bit of battle involved and want to save every penny possible, it surely won’t be. Ultimately, it just comes down to the price of the car. As mentioned, most people think that haggling over the price of the car itself is the only “real” part of making the deal, and that all that paperwork business you do in the back afterwards is just the anti-climatic wrap-up. Once the price of the car is settled, you can kind of relax, right? As explained above, car dealerships make a significant portion of their profits from financing, warranties, and other add-ons. Therefore, the dealer may actually put more pressure on you to sign up for these financial products, than they did in trying to get you to buy the car. So stay alert when you step out of the shiny showroom and into the dealer’s fluorescent-lit offices. If needing a loan, consider getting it from an outside provider. Just like everything else in this process, the interest rate the dealer offers you on a loan is negotiable. If you secure approval for a loan from a bank first, you can negotiate that rate as well, use it as leverage with the dealer’s finance guy, and ultimately go with whichever is better. Keep in mind that if a dealer knows you’re not going to be financing through them, they’ll be less generous when negotiating the price of the car itself. So best not to reveal this information until after you’ve shaken hands on that part of the deal. Don’t buy ANY add-ons. In addition to being sold on signing up for the dealership’s financing plan, you’ll also get the spiel about a million different “crucial” add-ons like warranties and various protections for your new car — from undercoating that protects its underside, to seat protection which guards against spills, to free windshield replacement (which most insurances cover, sometimes even on an annual basis). As a general rule, don’t buy any of these. If anything is really important to you, it can often be found elsewhere for cheaper. The financing person will probably make it seem like the end of the world if you don’t buy these things. Remember, that’s basically their entire job, and they’re probably good at it. Don’t take their bait. It will be awkward, but just keep saying you’re not interested. With this part of the transaction, as with the process as whole, stand your ground, informed consumer! 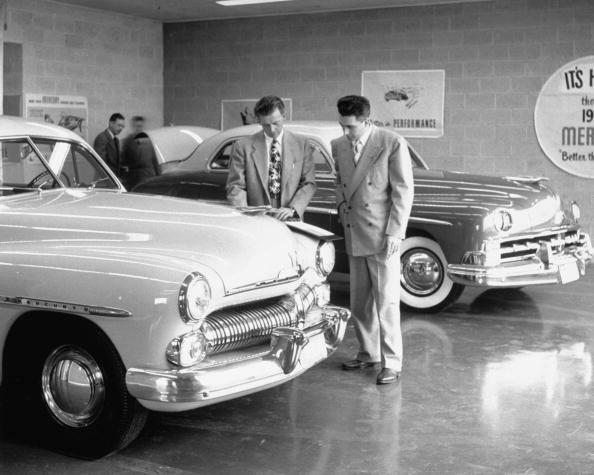 The post How to Negotiate the Best Deal on a New or Used Car appeared first on The Art of Manliness.